With only six percent of America's pilots being female, it is clear we in the GA community need to exert more effort to bring girls and young women into our world. With such disparity in pilot numbers between the genders, this under-representation of females on GA's flight decks is the one area that might well hold the key to the survival of GA as we know it. Meeks is a professional pilot that began her career in 1993 when she began flying Huey helicopters as a 2LT in the United States Army. She moved into the civilian ranks flying BE1900s for a US Airways Express carrier owned by Mesa Airlines. She's flown Citation IIs, Vs and the Beechjet for Flight Options before moving to her currently employer, NetJets, where she flies the Citation X. Meeks is living proof that females can excel in the modern aviation world. 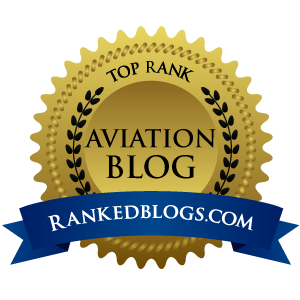 Recently, Meeks was gracious enough to find a few minutes between charter flights to answer a few questions for this blog. This is part one of the interview, where she talks about how the idea of Girls With Wings came about, and what it takes to keep it going. 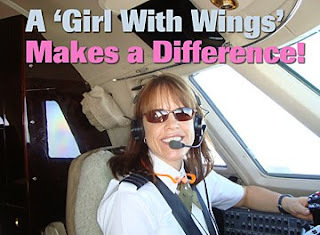 In part two to follow soon, Meeks will talk in depth about aviation's gender issue, and offers some great advice for girls who would like to get their wings. World of Flying: How did the idea of Girls With Wings come about? Lynda Meeks: I didn’t grow up wanting to be a pilot, but I do have a sense of adventure. So it’s additionally odd that I wouldn’t have considered being a pilot while being encouraged in Army ROTC until it was presented as a challenge. I think that’s a result of the overly pervasive impression that has caused the world of aviation into becoming so male dominated. I completed my pilot training in 1993, so after about 10 years of me trying to find airplane stuff for my nieces that wasn’t as boyish as what I bought for my nephews, I started getting a bit frustrated. But then, my friend Cindy Jacobs, who I had flown with at the regional airline, became pregnant with her first child, a girl. I spent HOURS on the internet looking for something, ANYTHING, with an aviation theme as a gift for a baby girl. And there was nothing. There’s a saying about if you find a deficiency, you can choose to fill it or choose to live with it. I decided to go out and buy an embroidery machine, with which I started creating t-shirts with airplane and helicopter appliqués. This was not a very successful business model because I ruined more t-shirts than I sold. But with every sale, I would get a story from someone who was either buying an item to encourage a future woman pilot, or was a woman who wanted to be a pilot but her dad, neighbor, teacher, etc., told her only men were pilots, or was a woman pilot anyway. Too many women pilots have and felt that there was too little support for women to undertake flight training;too many feel like they had been the first woman to get her license when really there are quite a few of us around and would have appreciated the encouragement of others. With the encouragement of Cindy Jacobs, and many others, the idea of Girls With Wings grew, to include not only pilots, but other women in aviation with the mission of encouraging more young girls to have an interest in aviation. World of Flying: Why is it important that the entire GA community work to entice girls and women to learn to fly? Lynda Meeks: The percentage of women pilots has not changed in nearly 100 years, but the percentage of student pilots that were women has been increasing. But that’s still only 12%, when women are 50% of the population. Aviation is still regarded as a male dominated occupation, when there is absolutely no reason that women can’t and shouldn’t be pilots. Additionally, I am in airports all the time and see very young girls get SO excited about flying and airplanes. But there’s a certain age where they may start to assume that airplanes are for boys if all they see are blue or red ones or military aircraft with olive green camouflage. Instead of trying to lure them back into a love for flying when they are older and considering an occupation, why don’t we maintain their interest as they grow? So yes, the Girls With Wings website is very pink (and purple) and girly. It took me several years in the military before I discovered I could be a soldier and still be a woman and now we let girls know they can be feminine flyers (or Air Traffic Controllers, or Airframe and Powerplant technicians, etc.). 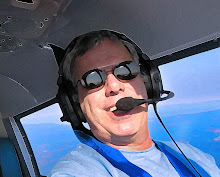 World of Flying: Tell my readers briefly about some of the GWW programs. Lynda Meeks: I’ve spoken of the website where there is a page of role models in different fields of aviation. You can click on each woman’s picture and read what they do and why they love it and even send an email to get more information. There are some games and coloring pages for the younger ones. There is a message board to help build community (which is slowly gaining in popularity!). I do the blog and extensive social networking as you know. The store is a way to promote the positive message of GWW which is that “Yes, Girls Can Fly!™” and that “It’s not how tall you are, it’s how high you fly.™” It’s also our fundraiser to provide for all of the stuff that we do. We do presentations at schools (referred to above) and I am forming clubs (slowly) around the country to train others to do the GWW branded presentation, and also to network in their community to promote flying and encourage other girls (or women) to get involved. The scholarship, currently just at one $1000 scholarship per year, is to provide funds toward flight training to progress in her private pilot’s license. Applications are to be an essay, with photo, stating why the applicant believes she is a role model for Girl With Wings to include her motivation, inspirations and future plans. The Penelope Pilot Project features our character Penelope Pilot encouraging more young girls to have an interest in aviation by promoting their participation in various aviation events. There is an interactive calendar where people can post and seek out events to attend with their downloaded and colored image of Penelope. Then they can post pictures of themselves on the website, www.PenelopePilotProject.org and receive an email back that they can forward to friends and family showing them what they can do! It’s a great way to show girls that other girls are interested in aviation stuff too. World of Flying: The work that goes into Girls With Wings must be enormous. How many people put in how many hours per day/week/month, and how has this work affected your personal and professional life? Lynda Meeks: It nearly consumes me because ideas bounce around in my brain nearly 24/7. I’m working on giving up more control of the operation to others who have volunteered to help since the concept of GWW is being so well received I’m having trouble keeping up with it all! Volunteers are the backbone for the success of Girls With Wings, whether in personal, financial or administrative terms . Most of the assistance I receive now is on an ad hoc basis such as volunteers for airshows or presentations. Cindy Jacobs, referred to above, is working solely on getting our first book, about Penelope Pilot, illustrated and printed. The club members will definitely contribute more once they are organized. And, via the social networking, I have gotten connected to many men who support the GWW mission. They have offered much computer and technical assistance, I equate the time I spend on GWW to what I would spend if I had a family. It’s very rewarding and it keeps me away from the TV.